1 A None No Power Seat 1 A is a Business Class Bulkhead seat that may have extra legroom due to an indentation in the bulkhead. The close proximity to the galleys may be bothersome. One of the two windows in this row is misalgined when the seat is upright, however when fully reclined there is a view from both windows. There is no floor storage during take-off and landing and the overhead bin storage is limited due to the presence of emergency equipment. The tray table is in the armrest, making the armrest immovable and slightly reducing seat width. 1 C None No Power Seat 1 C is a Business Class Bulkhead seat that may have extra legroom due to an indentation in the bulkhead. The close proximity to the galleys may be bothersome. One of the two windows in this row is misalgined when the seat is upright, however when fully reclined there is a view from both windows. There is no floor storage during take-off and landing and the overhead bin storage is limited due to the presence of emergency equipment. The tray table is in the armrest, making the armrest immovable and slightly reducing seat width. 12 A None No Power Seat 12 A is an Economy Comfort seat that may be missing a window. 12 F None No Power Seat 12 F is an Economy Comfort seat that may be missing a window. 15 B None No Power Seat 15 B is an Economy Comfort seat that is blocked off to allow more space for passengers seated in the window and aisle seats. 15 E None No Power Seat 15 E is an Economy Comfort seat that is blocked off to allow more space for passengers seated in the window and aisle seats. 15 F None No Power Seat 15 F is a standard Economy Comfort seat. 16 A None No Power Seat 16 A is an Economy Comfort seat. Passengers should be aware that in rows 7,9,16 & 17, the video screen is located beneath the seat and there is a button on the side of the seat to pull the screen forwards and up. 16 B None No Power Seat 16 B is an Economy Comfort seat that is blocked off to allow more space for passengers seated in the window and aisle seats. 16 C None No Power Seat 16 C is an Economy Comfort seat. Passengers should be aware that in rows 7,9,16 & 17, the video screen is located beneath the seat and there is a button on the side of the seat to pull the screen forwards and up. 16 D None No Power Seat 16 D is an Economy Comfort seat. Passengers should be aware that in rows 7,9,16 & 17, the video screen is located beneath the seat and there is a button on the side of the seat to pull the screen forwards and up. 16 E None No Power Seat 16 E is an Economy Comfort seat that is blocked off to allow more space for passengers seated in the window and aisle seats. 16 F None No Power Seat 16 F is an Economy Comfort seat. Passengers should be aware that in rows 7,9,16 & 17, the video screen is located beneath the seat and there is a button on the side of the seat to pull the screen forwards and up. 17 A None No Power Seat 17 A is an Economy Comfort seat. Passengers should be aware that in rows 7,9,16 & 17, the video screen is located beneath the seat and there is a button on the side of the seat to pull the screen forwards and up. 17 B None No Power Seat 17 B is an Economy Comfort seat that is blocked off to allow more space for passengers seated in the window and aisle seats. 17 C None No Power Seat 17 C is an Economy Comfort seat. Passengers should be aware that in rows 7,9,16 & 17, the video screen is located beneath the seat and there is a button on the side of the seat to pull the screen forwards and up. 17 D None No Power Seat 17 D is an Economy Comfort seat. Passengers should be aware that in rows 7,9,16 & 17, the video screen is located beneath the seat and there is a button on the side of the seat to pull the screen forwards and up. 17 E None No Power Seat 17 E is an Economy Comfort seat that is blocked off to allow more space for passengers seated in the window and aisle seats. 17 F None No Power Seat 17 F is an Economy Comfort seat. Passengers should be aware that in rows 7,9,16 & 17, the video screen is located beneath the seat and there is a button on the side of the seat to pull the screen forwards and up. 18 A None No Power Seat 18 A is a standard Economy Comfort seat. 18 B None No Power Seat 18 B is an Economy Comfort seat that is blocked off to allow more space for passengers seated in the window and aisle seats. 18 C None No Power Seat 18 C is a standard Economy Comfort seat. 18 D None No Power Seat 18 D is a standard Economy Comfort seat. 18 E None No Power Seat 18 E is an Economy Comfort seat that is blocked off to allow more space for passengers seated in the window and aisle seats. 18 F None No Power Seat 18 F is a standard Economy Comfort seat. 19 A None No Power Seat 19 A is an Economy Class seat that may have limited recline due to the exit row behind. 19 B None No Power Seat 19 B is an Economy Class seat that may have limited recline due to the exit row behind. 19 C None No Power Seat 19 C is an Economy Class seat that may have limited recline due to the exit row behind. 19 D None No Power Seat 19 D is an Economy Class seat that may have limited recline due to the exit row behind. 19 E None No Power Seat 19 E is an Economy Class seat that may have limited recline due to the exit row behind. 19 F None No Power Seat 19 F is an Economy Class seat that may have limited recline due to the exit row behind. 2 D None No Power Seat 2 D is a Business Class Bulkhead seat that may have extra legroom due to an indentation in the bulkhead. The close proximity to the galleys may be bothersome. One of the two windows in this row is misalgined when the seat is upright, however when fully reclined there is a view from both windows. There is no floor storage during take-off and landing and the overhead bin storage is limited due to the presence of emergency equipment. The tray table is in the armrest, making the armrest immovable and slightly reducing seat width. 2 F None No Power Seat 2 F is a Business Class Bulkhead seat that may have extra legroom due to an indentation in the bulkhead. The close proximity to the galleys may be bothersome. One of the two windows in this row is misalgined when the seat is upright, however when fully reclined there is a view from both windows. There is no floor storage during take-off and landing and the overhead bin storage is limited due to the presence of emergency equipment. The tray table is in the armrest, making the armrest immovable and slightly reducing seat width. 20 A None No Power Seat 20 A is an Economy Class Exit row seat that may have extra legroom due to the exit row in front. However this seat may also have limited recline due to the exit row behind. The tray table is in the armrest, making the armrest immovable and slightly reducing seat width. 20 B None No Power Seat 20 B is an Economy Class Exit row seat that may have extra legroom due to the exit row in front. However this seat may also have limited recline due to the exit row behind. The tray table is in the armrest, making the armrest immovable and slightly reducing seat width. 20 C None No Power Seat 20 C is an Economy Class Exit row seat that may have extra legroom due to the exit row in front. However this seat may also have limited recline due to the exit row behind. The tray table is in the armrest, making the armrest immovable and slightly reducing seat width. 20 D None No Power Seat 20 D is an Economy Class Exit row seat that may have extra legroom due to the exit row in front. However this seat may also have limited recline due to the exit row behind. The tray table is in the armrest, making the armrest immovable and slightly reducing seat width. 20 E None No Power Seat 20 E is an Economy Class Exit row seat that may have extra legroom due to the exit row in front. However this seat may also have limited recline due to the exit row behind. The tray table is in the armrest, making the armrest immovable and slightly reducing seat width. 20 F None No Power Seat 20 F is an Economy Class Exit row seat that may have extra legroom due to the exit row in front. However this seat may also have limited recline due to the exit row behind. The tray table is in the armrest, making the armrest immovable and slightly reducing seat width. 21 A None No Power Seat 21 A is an Economy Class Exit row seat that may have extra legroom due to the exit row in front. The tray table is in the armrest, making the armrest immovable and slightly reducing seat width. 21 B None No Power Seat 21 B is an Economy Class Exit row seat that may have extra legroom due to the exit row in front. The tray table is in the armrest, making the armrest immovable and slightly reducing seat width. 21 C None No Power Seat 21 C is an Economy Class Exit row seat that may have extra legroom due to the exit row in front. The tray table is in the armrest, making the armrest immovable and slightly reducing seat width. 21 D None No Power Seat 21 D is an Economy Class Exit row seat that may have extra legroom due to the exit row in front. The tray table is in the armrest, making the armrest immovable and slightly reducing seat width. 21 E None No Power Seat 21 E is an Economy Class Exit row seat that may have extra legroom due to the exit row in front. The tray table is in the armrest, making the armrest immovable and slightly reducing seat width. 21 F None No Power Seat 21 F is an Economy Class Exit row seat that may have extra legroom due to the exit row in front. The tray table is in the armrest, making the armrest immovable and slightly reducing seat width. 31 D None No Power Seat 31 D is an Economy Class seat whose close proximity to the lavatories may be bothersome as passengers often congregate in this area. 32 A None No Power Seat 32 A is an Economy Class seat that may have limited recline. The close proximity to the lavatories behind may be bothersome as passengers tend to congregate in this area. 32 B None No Power Seat 32 B is an Economy Class seat that may have limited recline. The close proximity to the lavatories behind may be bothersome as passengers tend to congregate in this area. 32 C None No Power Seat 32 C is an Economy Class seat that may have limited recline. The close proximity to the lavatories behind may be bothersome as passengers tend to congregate in this area. 32 D None No Power Seat 32 D is an Economy Class seat that may have limited recline. The close proximity to the lavatories behind may be bothersome as passengers tend to congregate in this area. 32 E None No Power Seat 32 E is an Economy Class seat that may have limited recline. The close proximity to the lavatories behind may be bothersome as passengers tend to congregate in this area. 32 F None No Power Seat 32 F is an Economy Class seat that may have limited recline. The close proximity to the lavatories behind may be bothersome as passengers tend to congregate in this area. 33 A None No Power Seat 33 A is an Economy Class Exit row seat with extra legroom whose close proximity to the lavatories may be bothersome. Passengers have often reported that it gets cold by the exits during flight. The tray table is in the armrest, making the armrest immovable and slightly reducing seat width. 33 B None No Power Seat 33 B is an Economy Class Exit row seat with extra legroom whose close proximity to the lavatories may be bothersome. Passengers have often reported that it gets cold by the exits during flight. The tray table is in the armrest, making the armrest immovable and slightly reducing seat width. 33 C None No Power Seat 33 C is an Economy Class Exit row seat with extra legroom whose close proximity to the lavatories may be bothersome. Passengers have often reported that it gets cold by the exits during flight. The tray table is in the armrest, making the armrest immovable and slightly reducing seat width. 33 D None No Power Seat 33 D is an Economy Class Exit row seat with extra legroom whose close proximity to the lavatories may be bothersome. Passengers have often reported that it gets cold by the exits during flight. The tray table is in the armrest, making the armrest immovable and slightly reducing seat width. 33 E None No Power Seat 33 E is an Economy Class Exit row seat with extra legroom whose close proximity to the lavatories may be bothersome. Passengers have often reported that it gets cold by the exits during flight. The tray table is in the armrest, making the armrest immovable and slightly reducing seat width. 33 F None No Power Seat 33 F is an Economy Class Exit row seat with extra legroom whose close proximity to the lavatories may be bothersome. Passengers have often reported that it gets cold by the exits during flight. The tray table is in the armrest, making the armrest immovable and slightly reducing seat width. 39 D None No Power Seat 39 D is an Economy Class seat that is in the last row of the plane and may have limited recline. The close proximity to the galleys behind may be bothersome. 39 E None No Power Seat 39 E is an Economy Class seat that is in the last row of the plane and may have limited recline. The close proximity to the galleys behind may be bothersome. 39 F None No Power Seat 39 F is an Economy Class seat that is in the last row of the plane and may have limited recline. The close proximity to the galleys behind may be bothersome. 40 C None No Power Seat 40 C is an Economy Class seat whose close proximity to the galley may be bothersome. 40 D None No Power Seat 40 D is an Economy Class seat that is in the last row of the plane and may have limited recline. The close proximity to the galleys behind may be bothersome. 40 E None No Power Seat 40 E is an Economy Class seat that is in the last row of the plane and may have limited recline. The close proximity to the galleys behind may be bothersome. 40 F None No Power Seat 40 F is an Economy Class seat that is in the last row of the plane and may have limited recline. The close proximity to the galleys behind may be bothersome. 41 A None No Power Seat 41 A is an Economy Class seat that is in the last row of the plane and may have limited recline. The close proximity to the galleys behind may be bothersome. 41 B None No Power Seat 41 B is an Economy Class seat that is in the last row of the plane and may have limited recline. The close proximity to the galleys behind may be bothersome. 41 C None No Power Seat 41 C is an Economy Class seat that is in the last row of the plane and may have limited recline. The close proximity to the galleys behind may be bothersome. 7 D None No Power Seat 7 D is an Economy Comfort Bulkhead seat that has extra legroom due to the position of the Bulkhead in front. However the close proximity to the lavatory may be bothersome as many passengers have complained that others congregate in this area when waiting for the lavatory. This row may also be missing a window. Passengers should be aware that in rows 7,9,16 & 17, the video screen is located beneath the seat and there is a button on the side of the seat to pull the screen forwards and up. 7 F None No Power Seat 7 F is an Economy Comfort Bulkhead seat that has extra legroom due to the position of the Bulkhead in front. However the close proximity to the lavatory may be bothersome as many passengers have complained that others congregate in this area when waiting for the lavatory. This row may also be missing a window. Passengers should be aware that in rows 7,9,16 & 17, the video screen is located beneath the seat and there is a button on the side of the seat to pull the screen forwards and up. 8 D None No Power Seat 8 D is an Economy Comfort seat whose close proximity to the lavatory may be bothersome as many passengers have complained that others congregate in this area when waiting for the lavatory. This row may also be missing a window. Due to the Exit Row behind, this seat does not recline. 8 E None No Power Seat 8 E is an Economy Comfort seat whose close proximity to the lavatory may be bothersome as many passengers have complained that others congregate in this area when waiting for the lavatory. This row may also be missing a window. Due to the Exit Row behind, this seat does not recline. 9 A None No Power Seat 9 A is an Economy Comfort Exit row seat whose legroom is obstructed by the protrusion of the exit door. The close proximity to the lavatories may also be bothersome as peole often tend to congregate in this area while waiting for the lavatory. Passengers have often reported that it gets cold by the exits during flight. The tray table is in the armrest making the armrest immovable and slightly reducing seat width. Passengers should be aware that in rows 7,9,16 & 17, the video screen is located beneath the seat and there is a button on the side of the seat to pull the screen forwards and up. 9 F None No Power Seat 9 F is an Economy Comfort Exit row seat whose legroom is obstructed by the protrusion of the exit door. The close proximity to the lavatories may also be bothersome as peole often tend to congregate in this area while waiting for the lavatory. Passengers have often reported that it gets cold by the exits during flight. The tray table is in the armrest making the armrest immovable and slightly reducing seat width. Passengers should be aware that in rows 7,9,16 & 17, the video screen is located beneath the seat and there is a button on the side of the seat to pull the screen forwards and up. Each seat has a personal television with audio and video OnDemand. Saga Class is Iceland Air's Business Class cabin. Passengers flying Saga Class enjoy good working space and Icelandair lounge access in Iceland and other countries. Full booking flexibility, including changes and cancellations. Saga Class has 22 seats and extends from rows 1-6. Economy Class is the lowest fare class. A choice of a seat selection is offered when booking a ticket. Soft drinks and access to the new in-flight Entertainment System are complimentary. Economy Class has 194 seats and extends from rows 19-41. Passengers should be aware that in rows 7,9,16 & 17 of the Economy Class, the video screen is located beneath the seat and there is a button on the side of the seat to pull the screen fowards and up. The maximum number of seats sold in Saga Class is 22 and the maximum number of seats sold in Economy Class is 194.However if not all the seats of this fare class are sold, these seats are convetible to fill additional Economy Class tickets. Seat does not recline due to location of emergency row. Seat storage underneath severely limited by IFE boxes and such. Seat very narrow. Air Nozzles only accessed by standing up if tall. TERRIBLE TERRIBLE Seat as is seat next to it. TERRIBLE. Free snacks & alcohol but terrible if you want to sleep on this flight. We flew toronto to keflavik in sept 2015 with an 8 hour stopover on our way to copenhagen. The seats do not recline that much so any chance of getting a decent nap ia pretty slim. Not a lot of perks...almost no choice of food, snacks wre more for economy class. Not worth the price. We planned an 8 hour stopover so that we could go to the blue lagoon. First when you get off the plane, there is a full security check that took 2 hours. They go through all your stuff pulling everything out of bags and claiming that my small tube of polysporan should have been considered a liquid. The area was nasty with paint fumes. The lounges that we had access to were mediocer at best. We head to the taxi stand to go to the blue lagoon. Quoted $60. U.S. For a 15-20 min ride. Went to the shuttle bus to check prices....thought $60. Return was more reasonable. But driver does not follow schedule---wasted another hour while the driver waited for every poaaible person to book tickets and also sold lagoon tickets to people while we all waited. The lagoon was great! But of course the shuttle bus did not arrive as per the schedule. We waited a half hour and not wanting to miss our flight we ended up taking the $60. U.S. Cab back to the airport. Wouldnt take icelandair again! 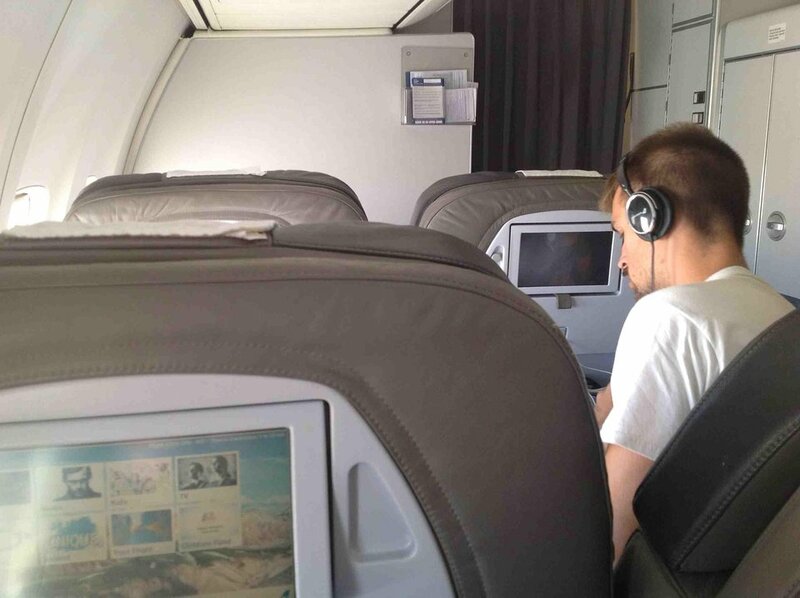 I flew Saga Class (Business) in Sept 2014 BOS-KEF. We sat in seats 5A & 5C and were pretty disappointed with the value of the seat. I felt like I was in a domestic 1st class seat as they didn't recline hardly at all. The flight was only about 5 hrs. and I never really got to sleep. If I had it to do again I'd save the money and fly in the Economy Plus seats. Icelandair flies 1 versions of Boeing 757-300.